"At Last, A Book That Reveals The Underlying Causes Of Your Dog's Health Problems And Offers Simple Solutions So That Your Pet Can Live A Longer, Healthier & Happier Life!" A Canine Naturopath, Research Scientist & Zoologist Reveals The REAL Way Your Dog Can Achieve Incredible Health. BHSc. ND., DC, DASc., GDSc. (Hons) Zoology, MATMS, MHATO. Worrying that you don't know enough about how to treat your dog yourself and be able to help them live a longer, healthier, happier life? Being concerned that the underlying causes of your much-loved dog's health problems are not being addressed? Always looking for answers to treat your dog in a safe, rapid and effective way but don't know how? My name is Sara Rooney and I am a fully qualified Canine Naturopath, Naturopathic Physician, Zoologist and Research Scientist here in South Australia. I have helped thousands of pets all around the world through 'Naturopathic Animal Services' (www.animalnaturopath.com.au). That's why you won't find another book like mine on the market ... because most practitioners don't have a clue what caused the dog's health disorders. They only know what to prescribe to STOP the SYMPTOMS! Unfortunately, just treating your dog's symptoms does nothing to actually heal your pet though. At best ... it just suppresses their symptoms. At worst - it will cause a more serious disease or more severe symptoms than they had before ... and cost you a lot of money in the process. The treatment programs in my book were born from my love of animals and of helping others look after their pets in the best possible way. My Purpose is to empower you by giving you powerful information so you don't need to be dependent on others for your dog's health. I set out to systematize the information I gathered. So now ... just about anyone could pop open this ebook and instantly begin to use the sure-fire, 100% guaranteed, professionally experienced and clinically validated treatment programs it contains. They've been proven to work by dog owners all around the world ... over and over again. “I found your wonderful book over the weekend and it has helped me to understand my girl's problems. I have gained a lot of information from your book and the extra informative booklets - they are excellent about how to help my girls. It is in plain English and extremely helpful. Thank you." “Muffy is a purebred Maltese who suffered red tear-stained eyes and repeated occurrences of vomiting, diarrhoea and gastric pain. He had been depressed and tired for a few months culminating in another one of these episodes. Muffy is like a new dog. He is playful, full of energy and very, very happy. Thank you so much Sara. If it weren't for you, Muffy would not be the new boy he is and be able to play like a puppy with his new brother Sammy." following 3 FREE BONUSES worth $49.97! This E-book normally sells for $19.99 but it's yours FREE! Find Out The Top Ten Anti-Cancer Herbs & Nutrients That You Need To Know About To Protect Your Dog (And You)! This E-book normally sells for $9.99 but it's yours FREE! “Sara, I can’t thank you enough for helping Emmy. She continuously suffered from itchy skin and ear infections before using your advice. The puzzle is finally solved and so are all her problems! Real Solutions for the True Underlying Causes of Your Pet’s Problems! Remember ... I am not some fly by night "guru" offering you a quick-fix, get rich scheme or a stay at home pet owner just trying to get your cash by trying to sell you some 'magic potion'. I have studied hundreds of thousands of hours to get my qualifications (Canine Naturopath, Naturopathic Physician, Scientist, Zoologist), researched health, naturopathic medicine and the animal sciences for over 20 years and most importantly, treated dogs like yours all around the world, through 'Naturopathic Animal Services' www.animalnaturopath.com.au and helped them achieve excellent health without the use of potentially toxic drugs. If you want solutions for your pet that don't take years to figure out ... and cost thousands of dollars. Then, this is the solution for you (because I've already been through all that for you!). For Too Long Now, I Have Witnessed So Many Sick Pets That Have Only Had Their Symptoms Treated, And I Felt It Was Time To Let People Know About The Real Causes Of Their Pets Problems So They Would Have The Opportunity To Treat Them Completely And Permanently. Just Prescribing Animals Drugs To Suppress Their Symptoms Does Not Usually Offer Them Any Long-Term Solutions And Can Cause Them Even More Problems. The Underlying Causes Of Your Dog's Health Disorders Need To Be Addressed So That Your Pet's Problems Can Be Treated At Their Very Core - Not Just On The Surface. After Many Years Of Trial And Error And Finding Out What Works And What Doesn't, The Most Effective Treatments For Common Health Disorders Have Been Identified And Can Be Found In This eBook. Through Many Years Of Research And Clinical Experience, I Have Identified The True Causes Of Most Dog's Health Problems. It Doesn't Matter Whether They Are Suffering From Skin Problems, Joint Pain, Heart Disease, Cancer, Diabetes, Infections, Autoimmune Disorders - Almost All Health Problems Can Be Treated Using An Effective System Of Healing That I Have Established. Packed With Cutting-Edge And Vitally Useful Information, "Heal Your Dog Naturally" Takes You On A Guided Tour of How to Heal Your Dog In The Most Rapid and Profound Ways. It Covers The Real Causes Of Your Dog's Health Problems, Nutritional Advice, Herbal Treatments, Nutrient Therapies, and Much, Much More, So That You Are Able To Help Restore Balance To Your Dog's Health Again. The Principle Naturopathic Philosophy On Healing Is That The Body Has The Ability To Heal Itself, When It Is In Balance - Even From Major Illnesses Such As Cancer. This Book Shows You How You Can Easily Help Bring Your Dogs Health Back In To Balance, To Allow It To Repair Itself. In Fact, Many Scientists Claim That When The Body Is In Balance, It Doesn't Suffer From Allergies or Skin Conditions, Cancer or Heart Disease, Diabetes or Thyroid Problems or Any Other Diseases - As All Of These Disorders Are Simply Signs That There Is Some Kind Of Imbalance In The Body. This Book Will Help You Identify The Cause Of Your Dogs Imbalance And Help You To Reverse and Correct It As Quickly As Possible. Treating Your Dogs Underlying Problems Will Give Your Pet The Best Possible Chance Of A Complete Recovery, Rather Than Just Temporary Relief From Their Symptoms. If You Are Looking For Clinically-Proven, Safe And Effective Ways To Help Treat Your Pet Quickly And Naturally – Then This Is The Book For You! I’m not exaggerating when I say that this book (& Sara’s advice) has saved Igor’s life! After many months of tests, Igor was diagnosed with SLE (auto-immune disease) and the vets put him on cortisone and told us that’s all they could offer him. They warned us that he will not see old age and that autoimmune diseases were common in bull mastiffs – not very helpful or positive advice. The vets also didn’t know ‘why’ Igor got the disease – maybe they should read this book then they might learn something! To look at Igor now - You would never know he had been so ill! His skin is now excellent and he is 100% symptom-free. Every dog owner in the world should read this book! If You Have Wasted Money On So-Called “Expert” Books On Health For Your Dog – That Simply Didn’t Deliver What You Really Needed To Know............... Or, You Have Paid Good Money For Books Written Only By Amateur Pet Owners With No Clinical Or Scientific Knowledge ……… Or, You Are Interested In Really Solving Your Pet’s Health Problems Once And For All And You Want To Avoid Huge Vet Bills, Then You Can’t Afford Not To Buy This Book! Never before have I read a book that offers so much information that can truly help dogs. I have bought many books over the years about natural healing but they all just offer basic advice on treating different disorders. This is entirely different! Sure it offers treatment advice for various problems but more importantly it provides real answers about the actual causes of disease – not just feeble advice on how to treat the symptoms. It will be my “No. 1” reference book from now on! This book totally changes the way I look at disease altogether – I can’t wait for Sara to write more books on health! Imagine How You Will Feel When Your Dog Has All The Health, Wellbeing & Vitality That They Had When They Were Puppies….When They Are Running Around Totally Pain-Free And Blissfully Happy To Be Alive. Your Pet Does Not Need To Suffer From Agonizing Skin Conditions, Joint Pain, Recurrent Infections, Digestive Problems Or Any Other Health Disorders A Minute Longer! Think Of The Satisfaction You Will Get From Knowing You Have Given Your Pet The Best Chance of Living a Longer, Happier, Healthier and Pain-Free Life! Please note: This is not a hard copy book. After payment, you will be able to download 'Heal Your Dog Naturally' to your computer straight away. We Needed to Know and More! Our 6 yo boxer, Milly, was diagnosed with a candida infection which had ‘No known cause’ - and this book explains exactly how she got it! We then followed the diet and treatment advice given in the book and Milly’s candida is now totally gone! No more itching! Her skin is now beautiful; her energy has returned; and best of all she is happy again. We now understand what we need to feed our dogs; what supplements we need to give them both and how we can prevent a whole host of other problems from developing. “Heal Your Dog Naturally” delivered everything we needed to know and more! Thank You Sooo Much Sara! At Last … Now You Can Help Stop Your Dog’s Pain And Suffering Rapidly and Safely …Without Drugs and Without Leaving Home – And, As A Bonus, You May Help Prevent the Onset Of Future Disease in Your Dog Using The Information In This Book. This Is Not Just Another Book On How To Treat Skin Conditions, Yeast Infections Or Joint Pain In Your Dog, …….Nor Is it Just A Book on The Correct Diet For Your Dog….It Is ALL of That And Much, Much More! If you are even remotely interested in learning the truth about the underlying cause of your dog’s health problems and finding out how to reverse these problems once and for all – you owe it to your beloved pet to at least read the information in “Heal Your Dog Naturally”. Remember, just “Thinking” about your dog’s problems will never heal them or provide them with the opportunity for a long, healthy and happy life. Our Beautiful Boy Is Happy Again! Clive was suffering from severe arthritis and his vet had him on pain killers and anti-inflammatory medications and said he needed to be on these for the rest of his life. NOT GOOD ENOUGH! We wanted other answers. We wanted to know ‘What’ was causing his arthritis – not just ply him with pain killers for the rest of his days. He’s way too precious for that. This book gave us all the answers and, better still – provided us with a successful treatment plan that DOESN”T cause more problems than what it treats. We can’t thank Sara enough for what she has done for Clive. No more pain. No more digestive problems and way more energy! Our beautiful boy is happy again! This Could Be YOUR Dog Soon Too! More And More Dogs Are Now Suffering From Serious Health Problems Than Ever Before – Cancer, Heart Disease, Diabetes, Joint Conditions, Skin Problems, Autoimmune Disorders …And At Much Younger Ages! The Truth Is That Most Conventional Drug Therapies Do Not Treat The Underlying Causes Of Any Of These Problems And In Some Cases They Cause Even Greater Problems Than Your Pet Originally Suffered From – Resulting In Long-Term Damage To Your Pet’s Health. 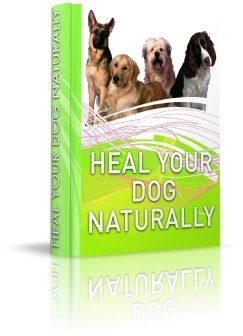 “Heal Your Dog Naturally” provides both clinical and scientific advice that may assist you to treat conditions in your dog which may help them to live healthier, longer and happier lives. It provides the guardians of animals, not with more theory – but with advice that can be used to treat the real causes of their pet’s health problems as well as provide advice on how to give their pets fast, effective and permanent relief from pain and symptoms. Not only can this significantly increase the quality of life for their dogs but it may also help to extend their life. "Canine Skin Conditions - Treating Them The Natural Way"
"Canine Cancer - Treating Them The Natural Way"
"Natural Treats For Dogs - Easy To Make Recipes That Your Dog Will Love"
Keep These Bonuses To Refer To Forever – Even in the unlikely event you decide to take advantage of our iron-clad, money-back guarantee and return “Heal Your Dog Naturally” for a full refund. When you are selling a quality product that you feel confident that people will want to recommend to others….. it is the best form of advertising. P.S. The Free booklets that are currently available with “Heal Your Dog Naturally” may not be available in the future and may change at any time. Please note: This is not a hard copy book. After payment, you will be able to download 'Heal Your Dog Naturally' to your computer straight away. There is nothing like this book on the market! Once you place your order on our secure server, you will be directed to the download page where you can download your books and get started IMMEDIATELY. The e-books are in PDF format, which can be viewed on any computer (PC or MAC). You can read them right on your computer screen or you can even print out your own hard copy. As soon as you have read the book, you can start treating your pet straight away and help to improve their quality of life without delay! Consider this – The small amount of money you invest in this book is a drop in the ocean compared to the amount of money you’ve probably already wasted on treatments that don't work or caused more problems than when you first started. The best news is that the cost of this book is absolutely nothing unless you agree that this book provides you with useful information that can help your pets to heal rapidly and effectively because you receive a…..
You Have Nothing to Lose and Everything To Gain To Help Your Much-Loved Pet Achieve Fabulous Health. Please try the treatment methods found in ‘Heal Your Dog Naturally’ and If you are not thrilled with the results you get for your dog, I want you to simply write and tell me, and I’ll send you a prompt and courteous, no questions asked, 100% refund. On the other hand, if “Heal Your Dog Naturally” helps you to treat your precious dog successfully so that they become healthier than they ever were before, then I want you to email me your success story or testimonial to tell me the great results you achieved – and please tell all your friends about it too. If You’re Finished For Good With All The Hype, Claims and ‘Quick Fix Cures” That Have Failed You In The Past And You Are Fed Up With Reading Books Written By Amateur Pet Owners With No Real Knowledge About Health or Science Or Any Clinical Experience And You Are Sick of Enormous Vet Bills That Do Not Resolve Your Dog’s Problems Permanently, Then This Is The Cutting-Edge, Scientifically-Based, Clinically Effective Information You Have Been Searching For On How To Heal Your Dog And Stop Their Suffering With Safe and Successful Treatment Methods That Have Been Tried and Tested, Time and Time Again on Thousands Of Dogs Around the World. You Can’t Afford NOT To Buy This Book! Click Below To Start Saving Money Today! When you click the order button, you get instant access to ALL of the information so you can start healing your dog straight away. I understand that once my order is processed I will be able to download “Heal Your Dog Naturally” immediately so I can start healing my pet RIGHT AWAY! I understand that I have up to 60 days to read all of the information in your book and bonus books and if I am not happy with what I have read I can return the book for a full 100% refund of my money and I still get to keep the bonus books.